My father died when I was 13. Since then, I’ve felt his absence with each year. So many milestones were met without him there. Getting my first boyfriend. Passing my drivers test. High school graduation, college graduation, move to a new state, receiving my MBA–each passed without his presence. Every man I loved made his way into my heart without first gaining the trust of my father. Perhaps this is why I’ve been so unlucky in love. There wasn’t a man who loved me more than any other man could to provide an example of what true love is, to set a standard by which I could evaluate every man who comes into my life. My daddy was an alcoholic who lost his life to cirrhosis of the liver. I’m angry at my father for some of the choices he made, but I don’t doubt for a second that he loved me and my mother. Addiction has gotten the best of many, so I can’t judge him–what good would it do anyway?–and sometimes addiction is stronger even than love. Regardless, I’m proud to wear my father’s name. I miss him every day and cherish the memories I have of him: his laugh, his smile, how he used to call me “Mama.” His undying love for UK men’s basketball. How he’d wear jeans even on the hottest days and rarely seeing him without a hat. How we used to fight over the last tomato from our neighbor’s garden, but in the end we’d always share it. So today, Fathers Day, I ate tomatoes. I drank a beer (his beverage of choice). I cried for the missed moments, those that have passed and those that are to come. But I smiled too. I remembered the good times and I thanked God for sending me my daddy, even if I only had him for a short time. I miss him so much. But I know he is watching over me. I hope he’s proud. 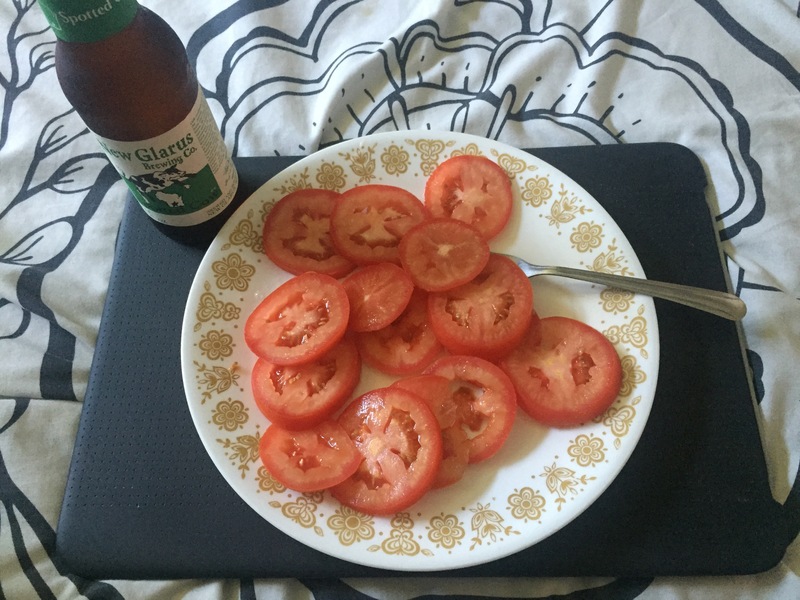 Tomatoes, with a sprinkle of salt, and a beer in honor of my daddy. Girl. You just made me cry. What a moving post! It makes me happy to see that you are still able to celebrate your father, despite some leftover frustrations and sadness. Losing a loved one is always challenging. I completely understand how difficult it can be to let your emotions go, but you’re right– judging at this point won’t help at all. Keep the happy memories. They are so important. Thank you. Regardless of how and why he left my life, I always hope I’m making him proud.